Virgin Class 390 Pendolinos meet on the Modern England route. The Virgin Pendolino trainset has just begun commercial service on the West Coast Main Line in the U.K. Originally developed for 140 mph travel, the fiasco following the demise of Railtrack has resulted in the line not being upgraded with the necessary signalling and maximum speed is 125 mph until further notice. 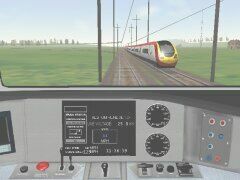 The MSTS Pendolino, VirginCl390.exe (2.1Mb) by Ben Laws, can be downloaded from UK Trainsim; registration at this site is free but it's difficult to log on before the day's download quota is exceeded - be patient! The Pendolino is installed into its own folder, VirginCl390. What began as an exercise to solve the problem of no horn sound in the cab eventually led to other changes to bring the MSTS Pendolino to more prototypical performance. There are a couple of steps not here yet, namely moving some lines around in the ENGine files - C/C++ programmers will love matching parentheses - and incorporating the Acela sounds by Joe Realmuto (brake rumble and squeal). Pendolino trainsets consist of 8 cars with a ninth car to be added in the future. A note: it's a little unfortunate the Pendolino's author kept the name of the sound files as acelacab.sms and acelaeng.sms, even though the only change to the original Acela sound files is the replacement of the Acela horn sound with the K31 for U.K. locos. Similarly, he's used acela.cvf for the cabview file name. You could change these names yourself to denote they're specific to the Pendolino. The reason for all these changes to the Pendolino started with there not being a horn heard when driving so we'd better show you how to fix the problem. Start WordPad and load the acelacab.sms file in the Pendolino's sound folder, namely Sound under the VirginCl390 folder. Use WordPad's Search facility or CTRL-F shortcut to look through acelacab.sms for k31_horn1. Look at each instance of k31_horn1 which WordPad finds for you - one of them needs .wav added to the filename. Do that, save the file and everything will be OK.